4-inch tilting touchscreen display on the front. 8 megapixel imager capable of 720p video on the back. Comes with the ability to create PowerPoint slides on the go. Comes with preloaded apps including Mail for Exchange (with MS Outlook sync of contacts, calendar, and notes and multiple calendars with meeting request support), IBM Lotus Notes Traveler, Quickoffice dynamic premium, Adobe PDF reader, and F-Secure Anti-theft. 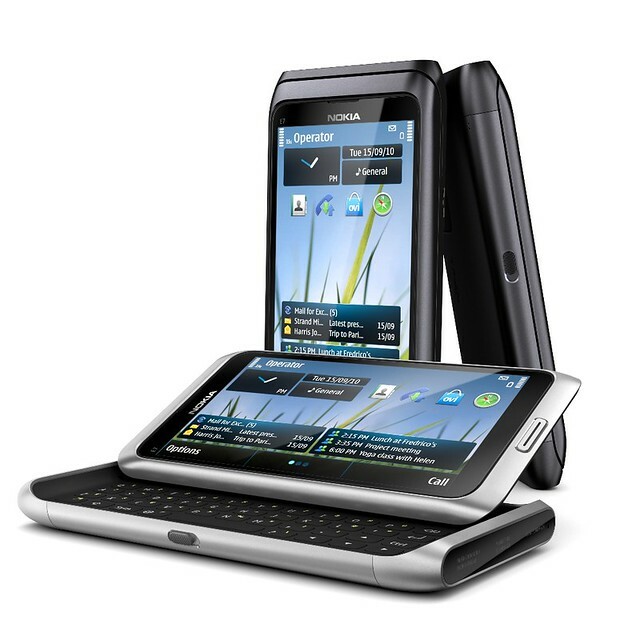 Nokia E7 will be available before the end of the year in exchange for €495 = $635 US Dollars. The Nokia E7 and N8 are almost identical outside of the E7’s 4-inch display and slightly bigger chassis required to host it. There are a few other differences, though. For example, The 12.9mm-thin N8 has an FM transmitter and 2mm charging connector unlike the slightly thicker 13.6mm E7. The E7’s bigger display also trims back the reported talk time to 540 minutes (the N8 does 720 minutes). The N8 counters with the better camera and stereo mic, thanks to a big 1/1.83-inch 12 megapixel sensor and Xenon flash that require some extra girth on the backend. Oh, and no MicroSD slot on the E7, you get 16GB and that’s it.